The new Ford Ranger due to be launched in South Africa later in the year will have a best-in-class water-wading capability of 800 mm. 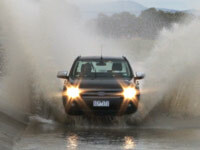 The 4×4 and 4×2 Hi-Rider models can wade through deep water even while carrying a full load. During the extensive water testing, Ford’s latest global compact pickup was loaded to gross vehicle mass –as heavy as it possibly could be – so that Ranger was riding at the lowest possible height. Engineers tested Ranger over a variety of water depths and speeds. For example, they drove Ranger at 30 km/h, 50 km/h and 65 km/h through 50 mm of water , to simulate going through big long puddles on the ground. They then increased the depth at 50-mm intervals until they got to 800 mm, at which the engineers were driving through the water bath at a vehicle speed of 7 km/h, or approximately walking pace. The water bath is 50 m long and has angled sides to replicate the bow wave that forms at the front of the vehicle as it pushes through the water. This closely simulates what happens in real life when Ranger has to wade through deep water. In the early stages of Ranger’s development, the engineers found that the alternator was too low in the Duratorq diesel engine for the 800-mm water-wading capability target. They proposed moving the alternator up high, as it would also be good for the component’s durability since dust or stones are less likely to get thrown at it during offroad driving. For components that had to be below the water line, such as fuel tanks and rear parking sensors, they had to be suitably waterproofed to ensure they would do their job even when wet. Considering the height of the water line changes depending on whether the vehicle is moving or stationary – the water line starts higher at the front and slopes down towards the rear of the pickup when it’s moving due to changing pressure of the water – the biggest challenge for the engineers was in finding a place for all the components. On November 8 1911, Louis-Joseph Chevrolet co-founded the Chevrolet Motor Car Company with William C Durant – who had lost control of General Motors the previous year – and investors Dr Edwin R Campbell (Durant’s son-in-law) and William Little (manufacturer of the Little automobile). It may come as a surprise to many people that the man behind the name Chevrolet – a name that is now as synonymous with America as blueberry pie – was actually born in Switzerland and was of French descent. From 1895 to 1899 he worked as a mechanic before moving on briefly to Paris then Montreal, Canada until finally, in 1901, settling in New York, USA, initially working for an engineering company before securing a job with the Brooklyn operation of the French car manufacturer De Dion-Bouton. In 1905 Louis was hired by Fiat as a racing driver before he joined a company in Philadelphia developing a radical (for the time) front-wheel drive racing car. He went on to race Buicks, in doing so forming a strong relationship with Durant, the founder of General Motors. Louis learnt car design whilst working for Buick and despite the lack of a formal education, by 1909 was experimenting with his own overhead-valve six-cylinder engine with financial assistance from Durant. By March 1911, Louis was building the first prototype Chevrolet in his machine shop situated at 701 Grand River Avenue, Detroit and three months later a factory was leased at 1145 West Grand Boulevard. The first production year, 1912, saw a total of 2 999 Classic Six touring cars being built. In June 1913, Chevrolet and the Durant-owned Little Motor Car Company were merged to form the Chevrolet Motor Company of Michigan, with production moving to two plants in Flint. Such was initial demand, in the same year a third assembly plant was established in New York. Two other significant events took place in 1913. After a dispute with Durant over design, Louis left the company bearing his name – and the bowtie emblem was introduced. Two stories exist on how the badge was derived: one claimed it came from a Parisian hotel wallpaper pattern seen by Durant, the other says it was based on a logo for Coalettes, a pure carbon fuel substitute for coal. In 1915 yet another factory was leased for vehicle assembly, and the Chevrolet Motor Company of Canada was incorporated and a manufacturing facility established. Electric lights became standard on all models. 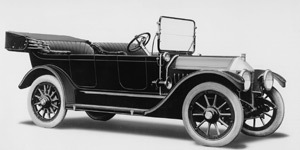 In 1916, the Chevrolet 490 Roadster and Tourer were introduced with a price of $490. The company then established America’s first West Coast assembly plant in Oakland, California and the following year the Chevrolet Motor Company of Texas was incorporated, based in Fort Worth. Then the Toledo Chevrolet Motor Company was set up to build transmissions while a plant in Michigan was bought to manufacture small parts and the Mason V8 engine. The first ‘closed top’ Chevrolet was produced in 1917 and the success of the 490 pushed unit sales past 100 000. But a major change in Chevrolet’s history was about to take place. Durant merged his Mason Motor Company with Chevrolet then, after six years away, regained control of General Motors and, unsurprisingly perhaps, on May 2, 1918, Chevrolet joined the GM Corporation.